UPDATE: This article has been updated with information provided by Georgia Tech. The library will not be “book-less” as previously indicated. Rather, 30,000 books, including Sci-Fi, popular, and core collections will remain. With a decrease in physical book usage in the digital age—in favor of online publications—academic libraries have been forced to adapt to the changing ways of research. Now, Georgia Tech is in the midst of renovating their main library in order to create a “research library of the 21st Century.” Demolition has begun on the library’s Crosland Tower as part of the Library Nextinitiative. Crews have spent the past few months stripping the tower—which used to be filled with books—readying it to be a lighter, brighter home for technologically focused media. Renderings indicate a glassy new facade will replace the existing red brick. The university plans to merge their book collection with Emory University at an offsite location, freeing up the renovated library building for a range of non-book research uses. While the core collection will remain on campus, officials from Georgia Tech note that 95 percent of the collection is now in storage. Once renovations on the library tower wrap next fall, operations of the library will transition from the building next door. 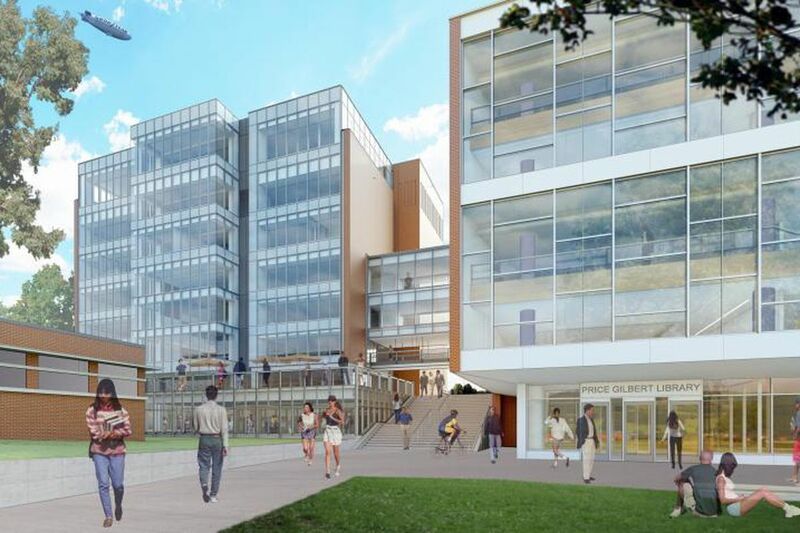 By 2020, if all goes according to plan, the entire Price Gilbert Library will be renovated and reopened. In the meantime, students can expect construction fences and work crews to accompany their academic pursuits.